I'll use the template from the old forum for neatness. symptoms: Possible urinary tract infections, puffy fur and generally looking unwell. number of infected/lost to date: 2 UTIs, 3 looking unwell. None lost. events/places visited within the last 3 weeks that may pose a risk to others: Preston show, 8th October. Skeldale and Battleflatts vets. link to thread with more info on: Esme looked unwell first, which may or may not be connected. Thread is here. Second thread with UTI info is here. 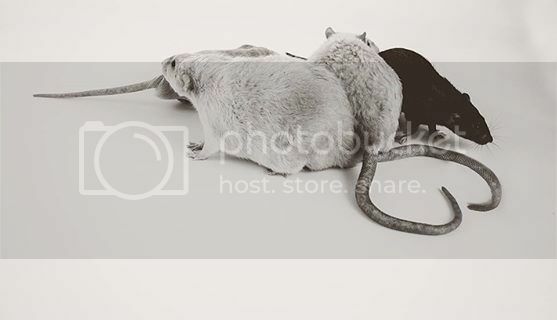 any additional info: Only two rats have UTI symptoms, the other 3 possibly infected are different - one has had a previously well healed abscess return, one is just a bit foofy and sneezy and one has no easily pinpointed symptoms but is definitely not "right", so possibly just bad coincidence. All 6 in that cage are being treated with Baytril. The rats with UTI symptoms are also being treated with Septrin and Metacam. Thank you - the initial post has now been edited. Any additional info: We believe this is the SDA virus: "Sialodacryoadenitis (SDA) virus is an infection of the salivary glands, and symptoms can include sneezing, wheezing, runny eyes and nose, labored breathing, swelling of the glands under the throat, bulging eyes and sudden death. The disease is usually more severe in older rats. You can’t treat the virus, but you can treat the secondary infections that cause the most danger." Please be vigilant with your ratties as this is a very nasty virus, the first we knew was when Odin suddenly looked very ill and passed away within a shockingly short amount of time. Its taken our other 2 oldies Zeb and Lurr as well. Thankfully the others are all under a year old and seem to be fighting it at the moment with the help of meds. Muskrat wrote: I'll use the template from the old forum for neatness. A few of our rats were at the same show on Saturday 8th and the two young rescues started with URTI symptoms on the same day about 6 days later. They are relatively well since being on baytril but very noisy. My breeder rats are all fine. May be co-incidental but I thought I would mention it. Symptoms: fluffy, staring coat; excessive porphyrin staining especially crusted on eyes; one rat with swollen throat gland (left side); wheezing, squeaky lungs, loads of sneezing. Worst affected rats became floppy, inert, lacked appetite, photosensitivity presented as squinting under light and prefering dark corners. Number of rats affected/lost: 1 rat lost, pts after becoming too ill to go under anaesthetic for unrelated abdo mass. Rat completely inert, laboured breathing, one eye porphyrin crusted. Other affected rats gaining in number, currently at 8 out of 19. Events/places visited in last 3 weeks that may pose a threat to others: vets only. Additional info: initially only oldest/sickly rats affected, now spreading to younger healthy rats. One whole cage of 6 boys plus 2 old boys in neighbouring cage. Several abscesses appearing presumed due to compromised immunities. any additional info: We initially had two 9wk old rats (that came from EGPRR) that presented with swelling in the neck. There were no other signs of illness so we assumed this was a possible allergic reaction. Then we found Pablo displaying the above symptoms; however he had a tumour attached to his ribs so we thought it was related to his tumour. We then found his previously healthy cage mate Ivan with the same symptoms. Although I have noted above that I went to the show, we believe it is most likely the virus came in with the babies we took in recently. The two rats I took to the show have shown no symptoms of illness and are not under observation. I would just like to state that no rats at EGPRR have SDAV, or are displaying any symptoms. We have the female babies from the same litter as was taken to Sidney's Safe House, all of which are healthy and are doing well. Sorry to hear of the outbreak with you guys, and we will quarantine any rats who display any ill-health in light of this. Symptoms- fluffy coat, unwell, squinty eyes, prophryn from nose, one rat is around both eyes as well, respiratory problem, crackly chest noises, sneezing, clicking noise when breathing, rapid breathing, cold to touch, and coughing sort of sound on occasions. can i just add to above post, had 1 pts because of the virus, pneumonia. Sweet Rattery Illustrations - personalised illustrations of your ratties and other furry friends. Mummy to the Rattray Stud rats. Waiting at Rainbow Bridge - 164 ratty angels.